Madison Coupon Connection: FREE Freshetta By the Slice Pizza (after rebate)! 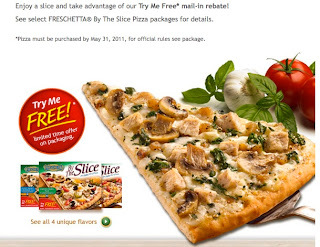 I just received an e-mail that Freshetta (a great tasting pizza in my opinion), has a new "Freshetta by the Slice" product which will (for a limited time) have a "try me free" rebate offer on the box! Be on the lookout for these specially marked boxes in your grocery store! I'm hoping to check this out at Copps tomorrow (hopefully I'll remember, anyway ;-)). If when you find them, let us know where & when in comments below this post! Ok, I completely forgot to look for these at Copps this morning. Has anyone seen them anywhere in the area yet (with the try me free rebate) indicated on the box?